* In round-robin weight classes win-loss records are used in the "Score" column. Brother Martin won six individual championships at the Mandeville Open on Saturday, November 11th. Four Crusaders placed second. St. Paul's had five champions behind their two defending Division I state champions Cole Houser and Jared Thieler. Houser, actually a two-time defending Division I state champion, was pushed hard in the finals by Brother Martin's Alex Duncan. Houser won the match via a 3-2 score. Holy Cross won eight of the 14 weight classes at the 2nd Jesuit Invitational on November 18th at the Jesuit gymnasium. Jesuit won five weight classes and De la Salle won the remaining one. More on this event will be found at a later date on the Louisiana Wrestling News Website. The host Fontainebleau Bulldogs won the Bulldog Brawl on Saturday, November 18th, with 208.5 points. William Broussard, Adam Lampo, Kyle Boell and Collin Schneider won titles for Fontainebleau. Brother Martin had two champions, Justin Leal and Daniel Croy, and placed second with 192.5 points. Four titles for the Ouachita Christian Eagles, won by Sam Pitts, Mikey Gordy, Matthew Matherne, and Connor Costello merited a third-place team finish. While winning team championships can be done without individual champions - that was last week's news for St. Amant. On Saturday, November 18th, the Gators took an easier road to score 201 points and win the Griffin Open at Dutchtown High School, their second team title in as many weeks. This time the Gators had five weight class champions and five runners-up. East Ascension had four champions and placed second with 151 points. Gavin Christ of Basile was voted the Outstanding Wrestler of the tournament, scoring two first period falls in the placement bracket and a fall in 2:46 followed by a 17-0 first period Technical Fall in the finals. LEFT: Trent and Brad Mahoney won 1st and 4th-place awards at the Griffin Open. 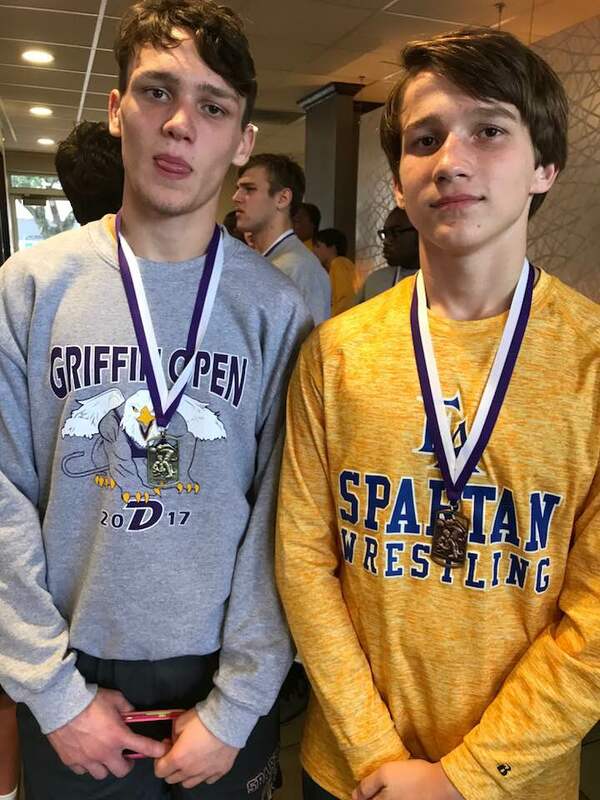 RIGHT: Basile's Gavin Christ was voted the Outstanding Wrestler in the lower weight classes at the Griffin Open. 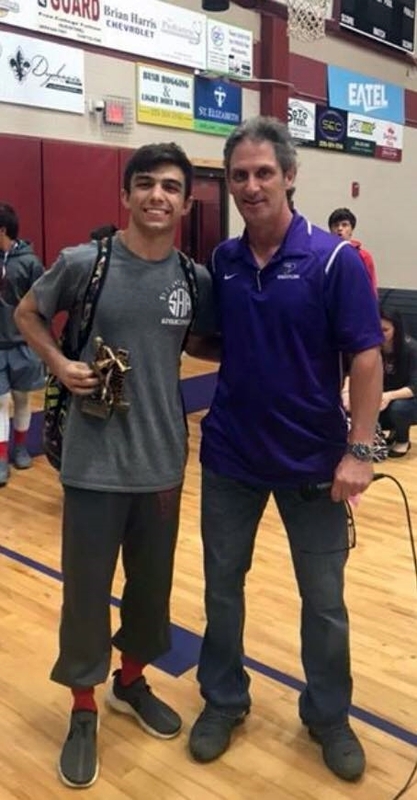 St. Amant's Hunter Hawkins was voted the Outstanding Wrestler in the heavier weight classes. Live Oak dominated the Live Oak 8 with four champions and four runners-up, scoring 185 points. Jordan Griffin, Camdyn Ingram, Karson Jones and Anthony Ingram won championships for the Eagles. Shaw placed second with 137.5 points behind wins by Ashton Surrency, Martin Garrett and Eduardo Garcia. Brother Martin won the Cinco Ranch Big 12 tournament for the fourth consecutive year, scoring 272.5 points, 112 more than runner-up host Katy Cinco Ranch. The Crusaders had eight individual champions, and all 13 Brother Martin wrestlers entered placed in the top-five. Sophomore Logan Bertot of Brother Martin won the 120 lbs. 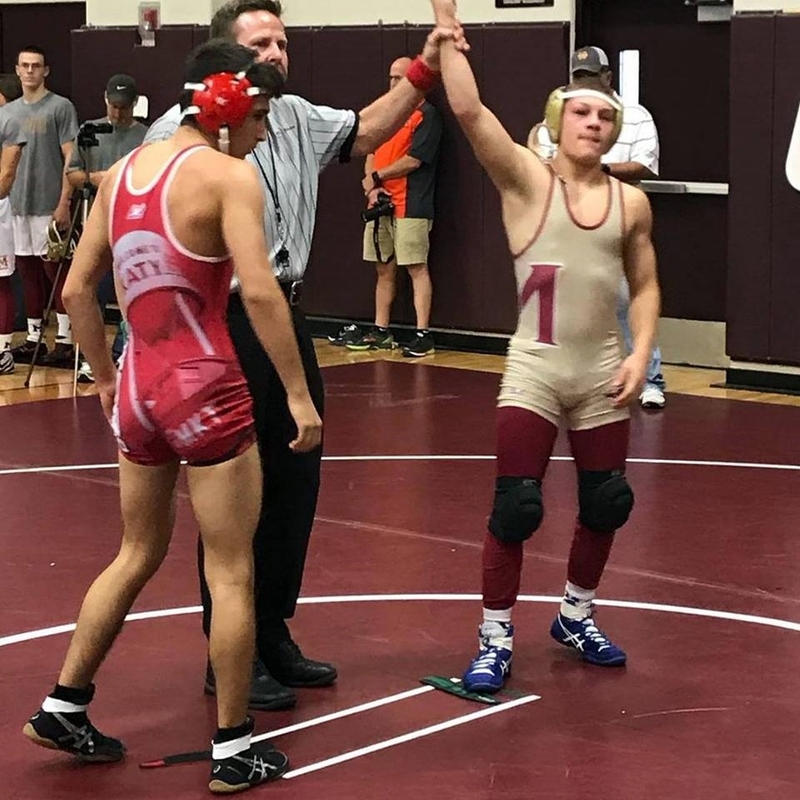 weight class at the Cinco Ranch Big 12 on Saturday with a quarterfinal 10-1 Major Decision, a 10-5 win in the semifinals, and a 16-3 Major Decision over Dylan Moody of Katy High School.. In the first of the GNO area Catholic League district matches Jesuit defeated Rummel 47-9 on November 15th at Jesuit. The Blues Jays' Max Holmes, Nathan Koenig, Paul Treuting and Darren Ferrier scored falls, and Colby Queyrouze and Luke Eccles scored Major Decisions. Tony Serio, Evan Queyrouze and Joshua Gaspard won decisions for Jesuit. The Raiders scored points via a fall by Blake Mateu and a decision by Alex Konnerup.